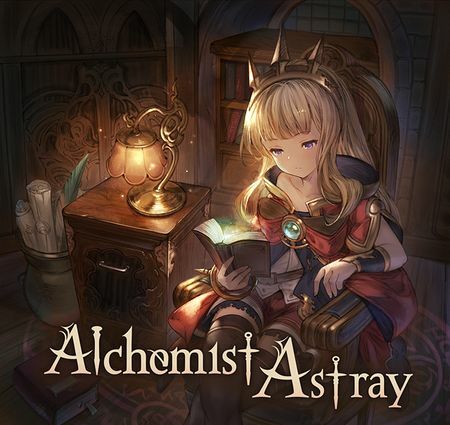 Alchemist Astray is a story event. and take it for themselves. Damascus Crystals are a good long-term investment given their scarcity outside of events. Obtaining all three (and the Damascus Grain) is recommended if AP/Elixir consumption is not a concern. Albedo Blaster is a Light Gun with a Medium EX ATK Up skill (at any level). It is a good filler for developing Light grids due to the rarity of Light SRs with ATK Up and the relative difficulty of farming the basic light grid. Albedo Blade is a Light Katana, which are very rare outside of Premium Draw. Despite its undesirable HP Up skill, consider keeping one for Ninja and Samurai until more advanced alternatives (eg. Huanglong Katana) can be acquired. 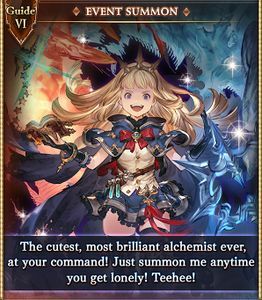 Super Cute Genius Alchemist has a weak aura but a powerful Call for new players. It is a decent filler summon until better ones are obtained. 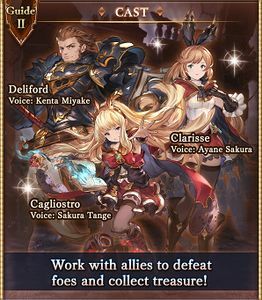 Dark-element healers are scarce and Cagliostro is one of them. Has both party heal and debuff removal which is great for new Dark players. Very long skill cooldowns limit her usefulness beyond early-game. 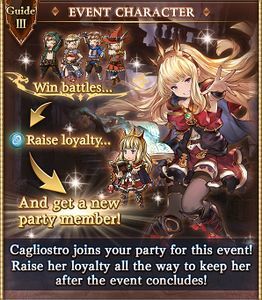 Cagliostro (Event) joins you permanently after raising her loyalty to 750. Multi-hit Light damage to random allies. Light damage to one ally. 3-hit Light damage to random allies. Light damage and 1500 Plain damage to all allies. Light damage to 3 random allies. Base charge diamonds: 2 → 1. Drop table last updated: 2017-11-01, all stated drop rates are estimates. Clear the mission each day to get loot! A new daily mission begins every day at 5 a.m. (JST). Daily mission rewards include Crystal ×50. 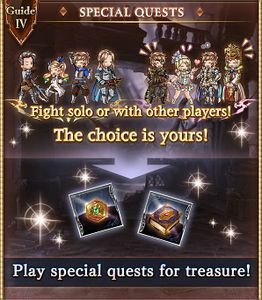 A Blue Sky Crystal appears as a daily reward on the last day of the event. 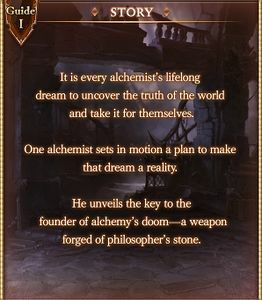 Alchemic Gothica outfit was obtained prior to the event. Coronation Ring 1 3 20 - Recommended. Lineage Ring 1 3 50 15 Recommended. Damascus Crystal 1 1 50 15 Recommended. Premium Draw Ticket 1 1 50 15 Recommended. Half Elixir ×2 1 75 10 - Recommended. Soul Berry ×2 1 100 4 - Recommended. Steel Brick 1 1 50 15 Recommended. CP ×10 1 20 10 - Recommended if you still need to unlock classes. Fury Stone 1 5 50 10 Do not buy. The kind of person who thinks with her feelings. Hmph... How very much like my younger sister. Is that the reason for this inescapable flow? Could that really be the case? 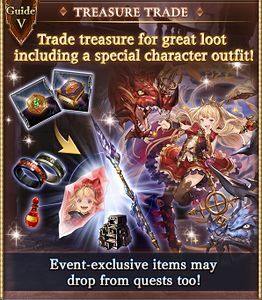 Cagliostro's gonna teach you all about true alchemy! This page was last modified on 18 April 2019, at 10:55.